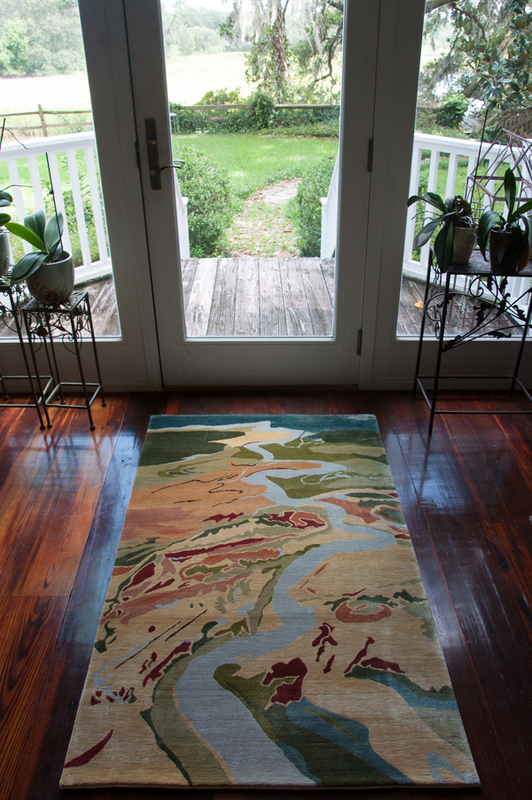 Ashley River, our first rug, has just arrived! 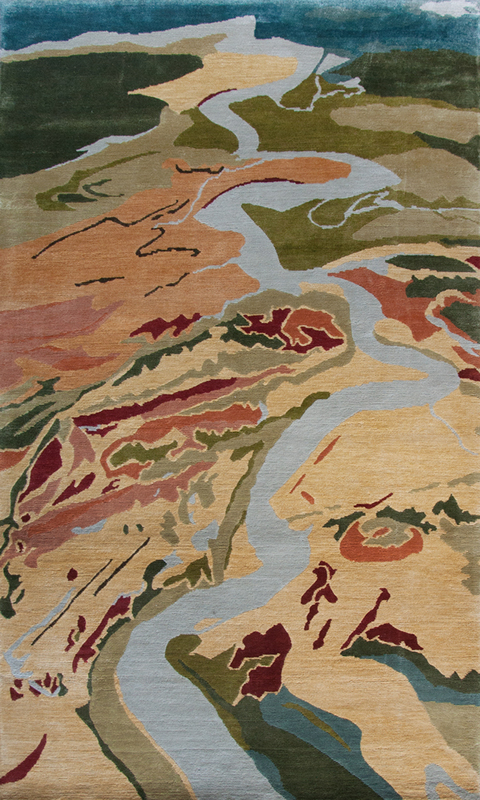 Two more rugs translated from batik on silk designs are currently in the works. Please inquire about price or make an appointment to come by the studio. Special orders for custom sizes and unique designs are available. Thanks to Nathan Tucker with his Lapchi Chicago team and the skilled weavers in Nepal for their expertise in producing these high quality rugs. Each design is a limited edition of 100, numbered and signed by the artist, Mary Edna Fraser. Atelier Lapchi uses true Chinese silk, a renewable resource, dyed in small batches with Procion MX dyes, the same chemistry that Fraser uses for her original batiks on silk. Cotton sourced in Kathmandu, where the rugs are made, provides the warp and weft fibers onto which the silk is hand knotted. 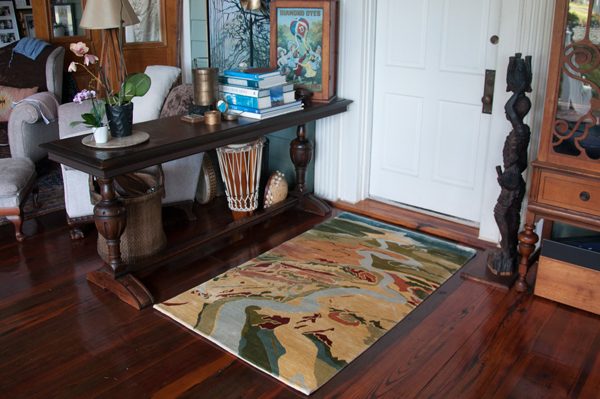 No latex or any coating is applied to the back, making a more environmentally friendly rug that will not yellow or harden, becoming an antique over time. Each loop knot is wrapped tightly around its warp and weft, making a beautiful enduring backing, finished with panels of cotton hand-sewn for a protective edge. 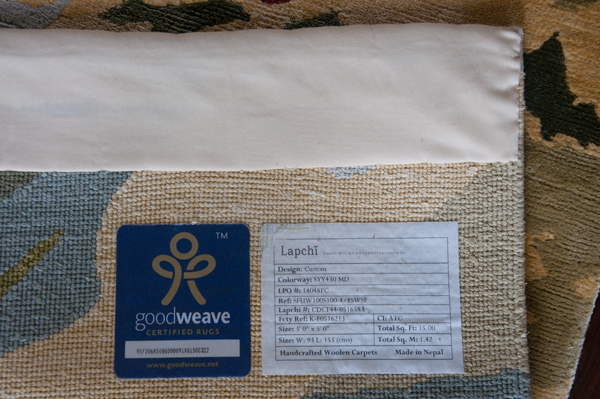 Each rug is certified by Goodweave.org to ensure that no child labor is used in the making of the product. Educational programs funded by Goodweave.org help children through “rehabilitation, day-care, literacy, formal schooling and vocational training” and they cite 3,700 children freed from the textile industry through their efforts.